By placing an order through Schwans.com, the Buffalo Boys Swim & Dive Team will earn 20% on food purchases and 40% on eGift Cards for the first 45 days (through January 21) and 5% on food orders for the next 90 days (though April 21)! Shop from over 300 high-quality, family-pleasing foods that are flash-frozen and delivered to your door - and might just be very handy this holiday season! The team will use the money raised to help pay for equipment, coaches and team bonding events & celebrations. 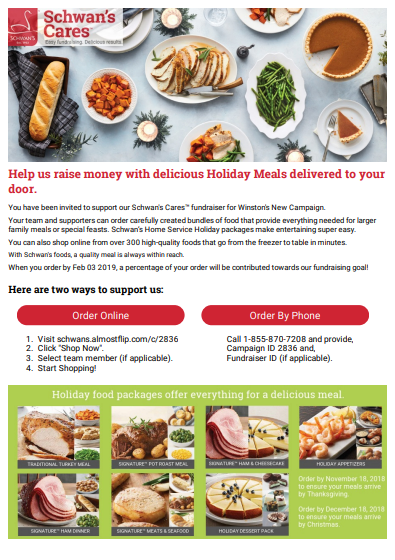 Please feel free to invite others you know (especially if they are already a Schwan’s customer) to place a Schwan’s order through this link. Thank you in advance for your support!